A level clean area of grass approx. 18'w x 29'd with no overhead obstructions such as power lines or trees. Vehicle Requirements: This unit will fit only in a Pickup Truck. Will not load in any cars/car trunk or SUV. Our bounce house combo systems include exciting jumping areas and fun slide exits, perfect for providing an extra level of activity and adventure.Bounce house combo's are a great entertainment source for all kinds of events. 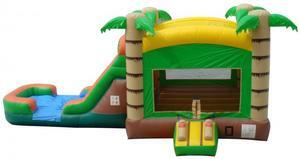 If you are looking for a bounce house for a party or one for a family event, the kids will be having so much fun, the parents can enjoy their event without having to worry about the kids being bored. Whether a child is seeking exhilarating fun or the child at heart wishes to have a blast, getting one of these is sure to create fun for a lifetime. To have a bounce house allows children to burn off energy as well as having as much fun as they can, to their hearts content.